Hi, I am interested in your 1978 Jeep J10 (stock #1275-NSH) listed on Autotrader for $17,995. I'd like to get more information about this vehicle and confirm its availability. Mid 70s pickup trucks are more popular than ever these days. They are good looking, capable machines that arent loaded up with a bunch of computers. 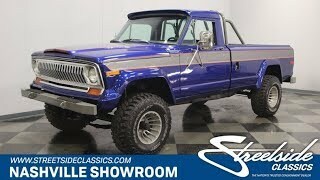 So, if you like the idea of owning one, but would prefer something you dont see on the road 100 times a day, then check out this Jeep J10 pickup. Its capable, tough and hard-working truck, and you dont see them that often. This is also a really good-looking truck. First because of the design of the body and cut of the sheet metal. The broad-shouldered stance and the power bulge on the hood make the truck look tough. And it is. Its also standing tall on 33x12.50s and that says this truck means business too. Then there is the first-class paint job. It is Blue with Silver highlights outlined with Orange pinstriping on the hood and down the side. Its a great color combination and has a great shine to it. Up front, the grill carries on the family resemblance with other Jeeps, although it is much wider and is beveled across the center. A heavy-duty front bumper is painted gray with rubber step treads and heavy duty tabs welded to it. There is a roll bar just behind the cab and the bed has been spray lined. Jeep is embossed into the tailgate and another heavy-duty bumper has a trailer hitch as well as two chrome exhaust tips peeking out from under it. Open the door and you will find a comfortable interior with a couple nice features. A beefy 4-spoke steering wheel feels good in your hands and gives you a firm grip on the wheel even during tough going. There is a Sun Pro tach mounted on the steering column and behind it is a stock dashboard with the speedometer in the center and the engine gauges off to either side of it. An auxiliary water temp gauge is mounted under the vents for the air conditioning system that sure is nice on those hot summer days and a Hurst shifter for the manual transmission rises out of the floor within easy reach. A Kenwood FM/CD stereo has been added for your listening pleasure and the vinyl bench seat is in good shape and comfortable for heading across town or cross country. A full rubber mat on the floor means you dont have to worry about muddy boots and there is even a gun rack in the back window for your convenience. Under the hood you will find a healthy 360 cubic inch motor nestled down in a neat and clean engine bay. A chrome air topper sits on an Edelbrock 4-barrel carburetor and Edelbrock chrome valve covers add a splash of flash to the engine bay too. The exhaust flows out through a true dual exhaust system with Flowmaster mufflers to those chrome tips at the rear. There are signs of good regular maintenance with all the hoses and belts being in good condition as well as tune up items like the cap and plug wires looking fresh. Power flows back through a 4-speed manual trans and the 4WD transfer case to solid axles front and rear mounted on leaf springs. Power front disc brakes provide good stopping power and those 33X12.50 Mastercraft Courser MXT tires are mounted on deep dish, multi spoke alloy wheels. Good looking, capable, and not a truck you see every day. Come on down and check it out.